An international team of scientists led by researchers from the Field Museum of Chicago (USA) and the Natural History Museum (London), have unearthed an large number of vertebrate fossils that provide an insight into the fauna that existed in a huge, lowland swamp that covered a part of the southern portion of the ancient super-continent Pangaea. The fossils are extremely significant as most of what palaeontologists know about life on Earth some 278 million years ago comes from fossils found in North America and Europe. Vertebrate fossils from South America dating from the Artinskian faunal stage of the Early Permian are extremely rare. 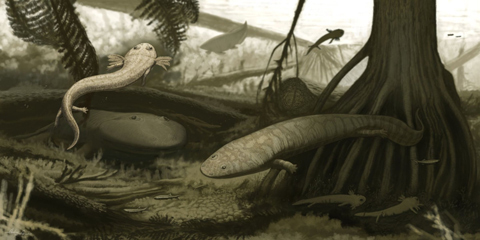 Amongst the significant fossil finds, the scientists writing in the journal “Nature Communications” describe fanged eel-like amphibians, hunters with huge mouths that resemble giant salamanders and a reptile which was previously unknown from South America. Evidence of the fauna of Brazil some 278 million years ago has been unearthed. The large lakes and swamps were home to an ancient ecosystem that was like nothing around today. Amphibians dominated this watery world and these newly described fossils from the Parnaiba Basin of north-eastern Brazil provide a detailed record of the fauna that was present in the southern part of Pangaea close to the tropics. For example, the lizard-like creature named Captorhinus aguti was previously known from fossils found in the south-western United States, this research extends this animals faunal range by a considerable margin. A resident of Brazil – Captorhinus. This reptile reached lengths of around half a metre, it had batteries of crushing teeth and it has been suggested that this Eureptile was probably herbivorous. The fanged amphibian is a new species, it has been named Timonya annae. Measuring up to forty centimetres in length, this amphibian has been described as a cross between a freshwater eel and a Mexican salamander. Although capable of moving around on land, it was very much at home in the water where it hunted small fish, other amphibians and invertebrates. 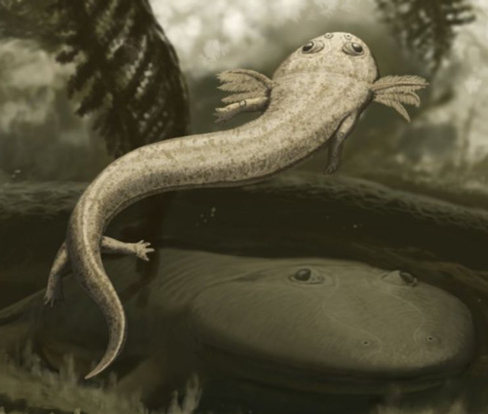 A fanged amphibian from the Early Permian. Lurking in the background of the picture above is a large, predatory amphibian, a member of the Rhinesuchidae family. As far as we at Everything Dinosaur are aware, the genera or species has not been identified within the scientific paper. It would have been one of the top aquatic predators in the lake system perhaps reaching lengths in excess of 1.2 metres. A close up of the Timonya skull. The other new species of amphibian has been named Procuhy nazarienis (pronounced pro-coo-ee naz-ar-ee-en-sis), the name means “fire frog” in the native Timbira language of this part of Brazil. It was closely related to T. annae and the name was inspired by the Pedra de Fogo Formation (Rock of Fire), where the fossils were found. The strata in the Lower Pedra de Fogo Formation (the stratigraphic zone that contains the fossils), is well known as it contains flints which were used to make fires. The term “frog” is also misleading, these amphibians were not closely related to extant frogs or indeed to that branch of the Amphibia that gave rise to the frog lineage. Everything Dinosaur acknowledges the contribution of the Field Museum in the compilation of this article.